What if you were trapped in a nightmare? Forever. (What a great hook line!) Norman Adams, a regular guy drifting through life, meets an old librarian, Mr. Breagal, who lends him a handful of books about dreams. Shortly afterwards, Norman becomes involved in a serious accident that leaves him in a coma. While in the coma, he finds himself in a lucid dream state (explained in the book) and caught between two worlds. Unfortunately for Norman, his dream is a nightmare. The enigmatic Mr. Breagal and a close friend and colleague of Norman come to the rescue in a most unusual way. 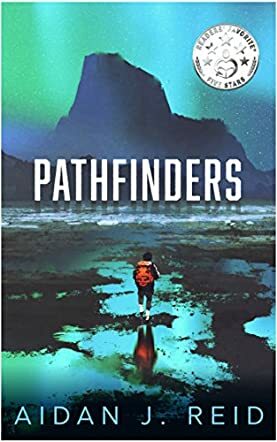 The premise for this science fiction adventure into the realms of metaphysics and horror is unique to me, but with his first novel, Pathfinders, Aidan J. Reid has joined my rather short list of favorite up-and-coming authors. Reid keeps the pace and interest in the story moving by jumping from dream to reality, character to character, in a smooth, easy to follow prose. Often, stories like Pathfinders will get bogged down by narrative details of the story’s foundation concept; here, lucid dreaming. Reid avoids that pitfall, however, by expertly weaving several sub-plots that explain the details in the story. All the characters in Pathfinders are true to life in action and dialogue. The author demonstrates great skill in showing rather than telling and he keeps the reader guessing until the end; a conclusion that is not only a prime example of poetic justice, but is equally surprising and perfect. Welcome to the world of published authorship, Mr. Reid. I’ll be looking forward to more of your work and recommend others do the same.